Moriarty's, 1116 Walnut Street, Convention Center District - for a better view, just click directly on the photo to enlarge it. Philadelphia Irish Pubs are ubiquitous, which is understandable. Since the 19th century, there has been a large Irish-American population in the area. And after nearly two centuries of development, the Irish, extroverted and warm, continue to assemble in pubs for entertainment and conversation. This guide is broken down by neighborhood. "$$" vs. "$$$" - Do You Want a Regular Irish Pub, Or Irish Upscale Dining? Broadly stated, the "$$" after a Philadelphia Irish pub's name, indicates that the place is what we generally think of as an Irish pub. Whereas the "$$$" after the name, indicates our opinion that the establishment is a hybrid, so to speak, of an Irish pub, with a contemporary restaurant. Of course, not every Philadelphia Irish pub fits neatly into one category or the other, but we've done our best. And neither category is inherently better than the offer - they just offer different dining and entertainment experiences. After a full day of absorbing the nation's historic treasures in Old City Philadelphia - this place offers even more history with your food and drink. It is housed in the Corn Exchange Building, which has intriguing architecture - and this old mercantile space has been renovated, to replicate how it looked in the early 20th century. It has two floors of seating - the upstairs dining room is a balcony. It's a big place, which can seat 85 patrons inside, plus 30 more, outside. In addition to the food and ambience, if you eat outside, you can take in the lively, active foot traffic scene in Old City. Evoking the pubs of both Britain and Ireland, is The Dark Horse Pub, which has plenty of football matches on the TV, British and Irish dishes on the menu, as well as an Old World feel and ambience. Its location on Headhouse Square makes it a good place to start or finish your exploration, in either Society Hill and/or South Street - which are both worth experiencing. You can eat outside, which we'd recommend for the foot traffic scene in Headhouse Square. It shares owners with St. Stephen's Green and The Black Sheep Pub, both discussed below. This is another veteran of the Philadelphia Irish pub scene - it has been here since 1976, the year the city hosted the Bicentennial Celebration of the Declaration of Independence. In addition to its South Street location, it also makes a good combination with a visit to Penn's Landing - which is nearby. Formerly The Black Door, the newly renamed establishment makes it pretty clear what you're getting - a Philadelphia Irish pub with a journalistic name. As with The Irish Times, the name pretty much summarizes it. It is one of three in the city, with its original locations in Far Northeast Philadelphia - that is, very distant from visitor territory. The chain began in 2004, and arrived on South Street in December 2007. One of two locations in Center City, the other, below. We personally love the chicken fingers, here - particularly with honey mustard sauce. In addition, the walls are plastered with 19th and 20th century photographs, pictures, and posters. Many of the leading political and historical figures of those eras are pictured, along with military recruiting posters for the Civil War and both World Wars. Most noteworthy are the sheet music for old Irish and American songs alike. It is a very large place. If you have a big group, it's a good choice because it can accommodate a large number of people on short notice. In pleasant weather, you can also eat and drink, outside, as they provide tables on the sidewalk. Moriarty's - the exterior of which is the photograph above - is an institution, by Center City Philadelphia standards. In 2010, it is now in its 31st year, at this location. Moriarty's is similar in tone and fare, to the Irish Pub. You can also eat on the sidewalk, and the vintage posters and photographs also adorn the walls. The most significant difference between them is their respective sizes. Moriarty's does not have the extremely deep interior, with tons of wide, comfortable booths, that its cousin across the street has, so it's not as good of a choice, if you have a big group. The Irish Pub also has a larger bar/common room in the front. And at Moriarty's, the tables are more packed in. But you can't go wrong with either choice - and sometimes, it's easier, with your party, packed in tight. This place is a little hole in the wall, compared to the Irish Pub and Moriarty's. Named after a legendary Celtic warrior, it is well-designed for an intimate conversation at one of the tables; the beers on tap are diverse. There is also a small club section, upstairs, called Prime. Its location is ideal, if you are looking for someplace near Market East Station, for the train. This place has nothing to do with the Black Eyed Peas, despite the name. Instead, Fergie's is a long-standing Philadelphia Irish pub, which offers a large selection of craft beer, the popular bar trivia game Quizo, and live entertainment, sometimes Celtic, sometimes not. McGillin's is actually pretty historic as well - it's actually older than City Hall itself - it has been there, since Abraham Lincoln was in the White House. We're not terrible spellers or typists - the name of this establishment really is spelled Tir na nOg! It is the Gaelic name, for the legendary paradise of Irish legend, the "Land of Eternal Youth". Although it won't keep you young forever, Tir na nOg has a superb location, directly adjacent to Suburban Station - one of the major Center City train stations. So you can't beat it for convenience. It also permits easy access to the many Philadelphia museums up the Benjamin Franklin Parkway. Tir na nOg is also very spacious, and highly conductive to large groups. Its collection of Irish memorabilia on the walls makes for engaging decor, and it's a great place to watch a sporting event. And in the event of pleasant weather, you can eat and drink outside. 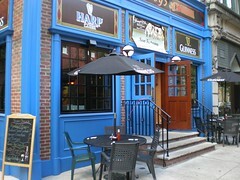 A new addition to the Philadelphia Irish Pub scene is Con Murphy's. It has two great advantages - as with Tir na nOg, it is also closely proximate to Suburban Station, and its location on the Benjamin Franklin Parkway makes it an ideal place, before or after visiting any of the major cultural attractions on the Parkway. As is the case with many restaurants located in hotels, Con Murphy's food prices are higher, than what they would be otherwise. (Its brunch offerings are expensive, but intriguing, as most of these places don't serve brunch.) Its menu is also much more gourmet, than that of the typical Philadelphia Irish Pub. Fado Irish Pub is part of a chain of Irish pubs, in various American cities, ranging from coast to coast. Although somewhat pricey, it offers Irish breakfast all day, as well as unusual desserts such as Brown Bread Pudding. An interesting aspect of this red-brick, upscale place, which has an actual shingle sign of a black sheep - a throwback to medieval times, when establishments used such signs to indicate their wares, to a largely illiterate population. The other location of the Irish Pub - the first is above, in the Convention Center District on the eastern side of Broad Street - offers a pleasant ambience, right on Rittenhouse Square - an oasis of urban tranquility. You can eat outside, and they also open the picture window in the front during pleasant weather, in order to maximize the number of open-air tables. Literally next door to the Irish Pub, we personally love The Bards. The one imperfection is that you can't eat outside there in good weather, which you can do next door. But the Irish beer collection is good, Irish photographs and paintings are everywhere. It has cozy booths conducive to intimate conversation, as well. Finnigans Wake is the official gateway to the neighborhood of Northern Liberties - located just above Old City Philadelphia. Finnigans Wake has its own unique story, in a building that was once a coffin manufacturer. Its Quiet Man Pub has memorabilia from the 1951 movie The Quiet Man, with John Wayne and Maureen O'Hara, filmed in western Ireland. Due to its huge size, the atmosphere of Finnigans Wake tends toward the nightclubbish, boisterous crowd, as opposed to the smaller Irish pubs in Center City. The witty name - St. Stephen's Green is a park in Dublin, Ireland, and which also refers to its Green Street location - got our attention. One of its co-owners is also the owner of the aforementioned Black Sheep Pub, down in Rittenhouse Square. St. Stephen's Green offers brunch and outdoor seating, both pluses. The corner was previously home to a Belgian restaurant, Cuvee Notre Dame, but the new owners have drastically altered what they inherited from the previous owner. It's a good place to hang out before or after your visit to nearby Eastern State Penitentiary - where you can be sure that the fare is much better than prison food! Kildare's is part of a chain of Philadelphia Irish pubs, with locations in Manayunk, King of Prussia, and West Chester (the latter two being in suburban Philadelphia). It has recently expanded to three college towns - Newark, Delaware; Chapel Hill, North Carolina; and South Bend, Indiana. Its slogan is - "Ceol craic" - "Food / Spirits - An Irish Experience". The phrase is Gaelic - variously translated as "music and good times" or "crack and music". Kildare's bills itself as "Authentic Irish Pubs", as their bars are constructed in Ireland, and shipped over the Atlantic, piece-by-piece. If you'd like to leave Philadelphia Irish Pubs, and return to the Philadelphia Restaurants Main Page, please click here.